Payment must be made by a Maybank credit/debit card. Proceed to membership lobby inside Universal Studios Singapore to process your Frequent Fear Pass. 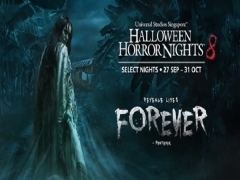 Promotion is valid for purchase of Halloween Horror Nights 8 Frequent Fear Pass from 1 July to 31 October 2018. Extension of validity is strictly not permitted. Halloween Horror Nights 8 Event Dates : 27, 28, 29 September, 5, 6, 11, 12, 13, 14, 18, 19, 20, 21, 25, 26, 27, 28, 31 October 2018. Valid for one (1) guest admission during event operating hours only. Promotion is valid for purchase of up to 6 Frequent Fear Pass per transaction, subject to availability. This event may be too intense for young children and is not recommended for children under the age of 13, Adult discretion is strongly advised.